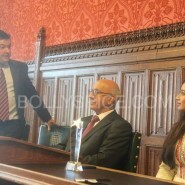 Shreya Ghosal was bestowed one of the highest honours today in London, by elected Members of Parliament (MP) in the House of Commons, the home of UK politics and centuries of democratic tradition. Shreya’s supreme talent, singing ability and services to Indian music were praised, in the presence of a select audience. Bollyspice was there to capture the special moment. Shreya was accompanied by her father, a scientist and engineer, who was instrumental in nurturing her talent. She was hosted by Labour MP Virendra Sharma of Ealing Southall, who is of Indian origin. Labour MP for Brent North Barry Gardiner, who has met Shreya and her father before. Labour MP Jon Ashworth of Leicester South, which is home to one of Britain’s largest asian communities and where Shreya will also be performing. 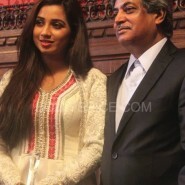 Shreya expressed that “This is such an honour to be here. You are helping to motivate me. I will do better music and something more meaningful in life, as a payback to the love you have given me.” She also shared how despite coming to London a few times as a tourist, this visit to the House of Commons was like a fairytale come true, which made her feel like a princess. Shreya also shared her experiences of being the only child who took to music, growing up in a neighbourhood of children who were predominantly groomed to become scientists and engineers. “Where I grew up, all my friends were either doctors or engineers. There was no alternate second option. The moment they came to hear that I was learning music, they all came and asked if I was sure I wanted to do that!” She hoped to inspire other children, parents and singers through her example.